Mount Kilimanjaro is the highest mountain in Tanzania and the tallest freestanding mountain in the entire world, reaching 5,895 meters (19,341 feet) above sea level. It has three volcanic cones: Kibo, Mawenzi and Shira, which are all dormant. Every year it is estimated that 40,000 people attempt to climb to the summit of Mount Kilimanjaro, although only about 40% of that number actually reach the top. Of the 40,000 people who annually attempt to climb the mountain, a significant amount of those people are doing it for charity. Climbing Mount Kilimanjaro definitely isn’t something that you decide to do lightly, as it is a challenging feat. It is truly a once in a lifetime experience and the ultimate travel adventure. Mount Kilimanjaro has five main trekking routes and two extra climbs suitable for more experienced mountaineers. All the routes cater for different people who have various walking and climbing abilities, but there’s definitely something for everyone. This trek usually takes up to a week to complete as the ascent and descent is very gradual. As a result, this offers some of the easiest acclimatisation’s and therefore has a high success rate of people reaching the summit. 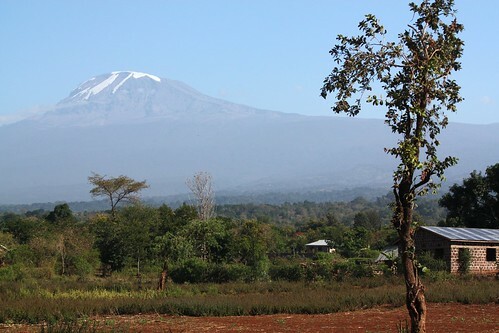 Machame offers some of the best views, but is quite a popular route so can be very busy. This trek isn’t the best for first time trekkers, but isn’t the most challenging trek either. The Marangu route has the reputation of being the easiest way to reach the summit of Mount Kilimanjaro. It has been nicknamed the ‘coca-cola’ route because people used to buy fizzy drinks along the trek from the tea huts. This is one of the shortest and cheapest routes and can be completed over 5 days. However, this allows less time to acclimatise, and therefore the success rate is less than the Machame route. The ascent and descent also uses the same paths, so the route is less scenic. Lemosho is similar to the Machame route, in that it is a gradual ascent and descent so has a high success rate of people reaching the summit. This route offers dramatic and incredible scenery including majestic gorges and stunning views of west Kilimanjaro. This route actually converges with Machame on about day 4 at Baranco. Rongai is the only route that comes from a northern approach and is the least scenic of all the routes. Although the first bit offers a fantastic adventure through the wilderness, the final climb to the summit is very challenging. Although the final push is quite hard, the rest of the trek is relatively easy compared to some of the others. Due to its lack of exciting scenery though, this route is not one of the most popular. This trek is definitely for stronger, more experienced mountaineers, as although it doesn’t require climbing as such, it is very steep. As it is very steep it is also a shorter route, and because of the rapid acclimatisation required it does not have a high success rate. This route is very remote and quiet, as it is considered one of the hardest paths available. It does offer some lovely views, and because it is a quiet route, you can enjoy them with your group in privacy. Although this route allows ample time to acclimatise because it takes an extended amount of time, the route is classed as a difficult scramble. This is because ropes and harnesses can be very beneficial on this route, although not technically required. 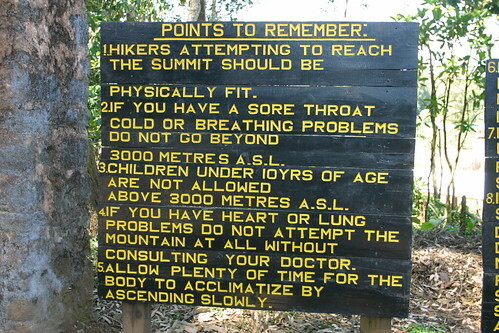 It is recommended that only experienced mountaineers take this route up to the summit of Mount Kilimanjaro. When climbing Mount Kilimanjaro you can book onto a tour with another group of people, or get in touch with a tour company who will offer bespoke tours for your group. You could also sort out the entire trip yourself if you’re good at organising. Climbing Mount Kilimanjaro is definitely the ultimate adventure of a lifetime. Whether you’re doing it for charity or to explore a beautiful part of the world, climbing Mount Kilimanjaro is a once in a lifetime experience. Checkout this Facebook page for more information about Kilimanjaro trips. It is always little whenever I read about kilimanjaro, great blog having great information especially to those who are planning to visit there. Nice post Alan! I love your descriptions of the routes. They are very accurate! And I really like that classic wood sign with yellow painted writing. Wish they could’ve kept the old classic Kilimanjaro sign on the summit!